The Miniatures series features the work of the following artists, choreographers, film makers and musicians. Tony Hill,Jan Kopinski, Laura Smith, Pete Shenton, Barry Hale, Jane Mulchrone, Stephen Friendship, Simon Withers,Mark Davenport,Mark Gwynne-Jones, Su Ansell,Caroline Locke, Kirsty Mitchell, Bill Ming, Stuart Collinson, Melanie Jordan, Andy Hewitt, Ronnie Fowler, David Wilson. The project was funded by Year of the Artist, Arts Council East Midlands, EMMI,European Regional Development and The University of Lincoln UK. 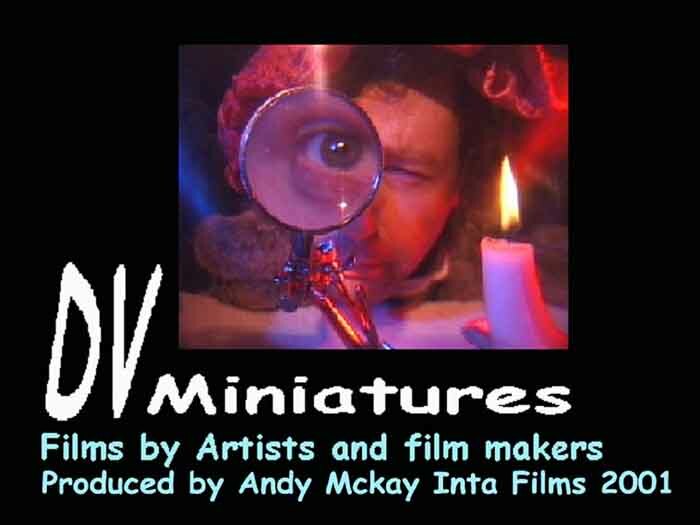 Listed below is a listind of some of the film festivals where some or all of the Miniatures have been shown. The idea is drawn from our interest in the picture postcard, from the kitsch, the straight-faced, the wildly exotic and the deadly dull. Sutton-on-Sea is chosen as the location because of a mutual fascination with marginal seaside towns and Simon is a resident artist on the sea front. A key feature of this work is a series of environmental interventions and installations. The film is composed of five separate scenes, one acting as a background and the four others superimposed. These scenes develop as a moving picture postcard through the use of dissolves. The form allows presentation of four separate but related scenes, but also enables the scenes to connect or juxtapose. It is primarily a piece about image, so connections between separate elements are made through compositional equivalence, metaphor & metonymy. I fell in love with an Orange Girl, bright as marmalade, at night she slept on a solar bed and dreamt in vivid grey... A film poem exploring the destructive power of our popular media, the constraints it places on what we consider beautiful and the damage caused to those who identify with the endless images of physical perfection. In contrast to the gloss and overproduction of our advertising industry, our films power lies in its immediacy and directness; a voice from the street that reveals how ugly our idea of beauty really is. The film evolves from the practice of Film maker Barry Hale and dancer and choreographer Jane Mulchrone. Chaos theory reveals how our every movement affects the unseen molecules around us. The compound effect of a tiny action can be enormous. 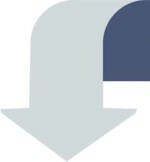 Within the space time dynamics of video feedback such tiny actions can clearly be seen to generate instant and massive change. 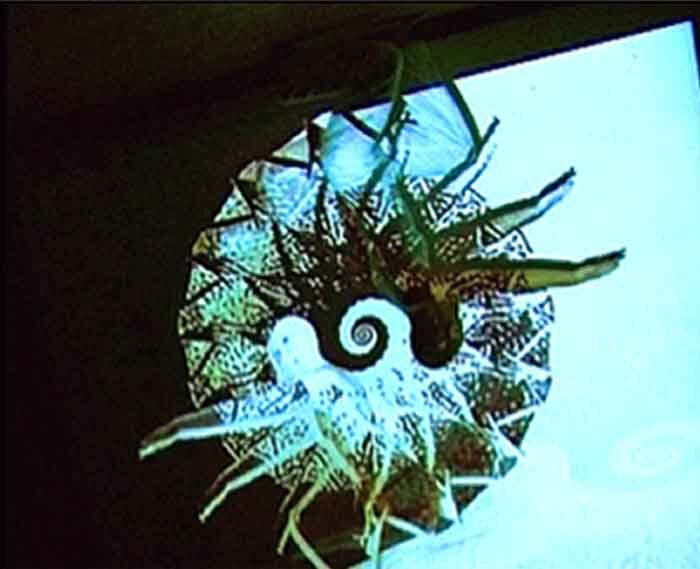 Phasia begins with film maker and dancer manipulating video feedback independently, as the artistic journey develops, the artists conspire to create architectures of light and physical form.
? Will ? takes its subject from superstitions and the idea of 'reversal' or making the unknown safe eg. by throwing salt over your shoulder. It uses stark images drawn from superstitions with some performance by Caroline. 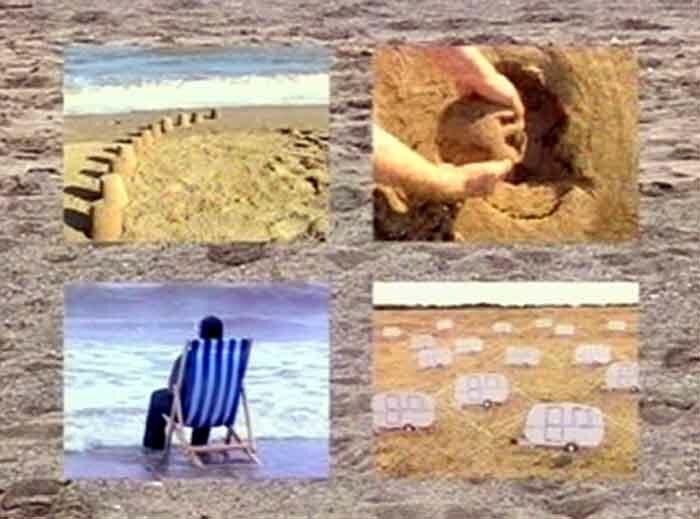 Images link with previous work such as the slit bellies of hammocks in Carolinas installations; slowly shedding their load of sand onto the floor. 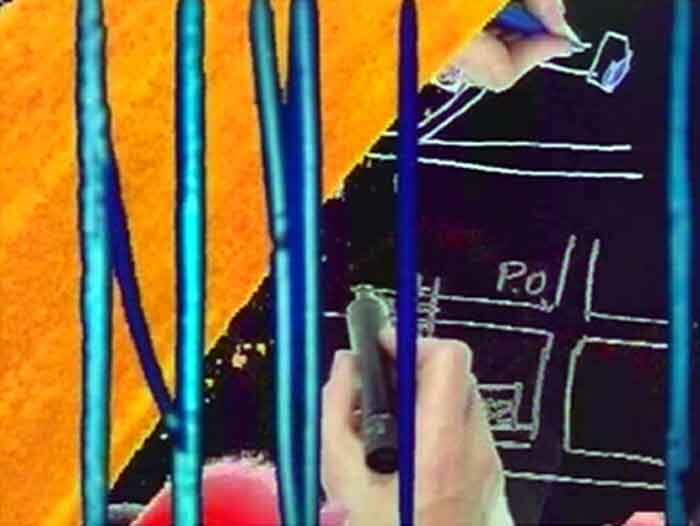 The visual style is akin to Su's film 'Cul-de-Sac' in which the subject staring into the lens is hit in the face by the camera swinging forward. We wanted the images to cross-connect , making reference to each other in a poetic manner. ?Will - the anti opposites looking it straight in the eye, superstitions, taboos rising to the challenge of the taboo, sense of release, letting go freedom versus determinism determination, overriding power NO?FEAR ? The collaboration emerged from a common interest in light, the hand-drawn image, the hand-made mark and a shared desire to work in an experimental. This subsequently developed into a film, using drawings, diagrams, doodles, scribbles and text. The intention is to celebrate the raw material of graphic and visual communication - from the energy and dynamism of simple marks on paper, to the indecipherable code that erupts from time to time on the computer monitor; and from the personal, non - commercial, non art, evidence of the hand - haptic, ordinary human activity. It is a non-narrative film stimulated by the interaction of visual rhythms created by looping the material, essentially this is a film for the eyes and ears and ?old brain?, as Len Lye termed it. The soundtrack consists of a collage of sounds which relate to drawing, paper, mark-making, text, language, writing, typing and word processing. 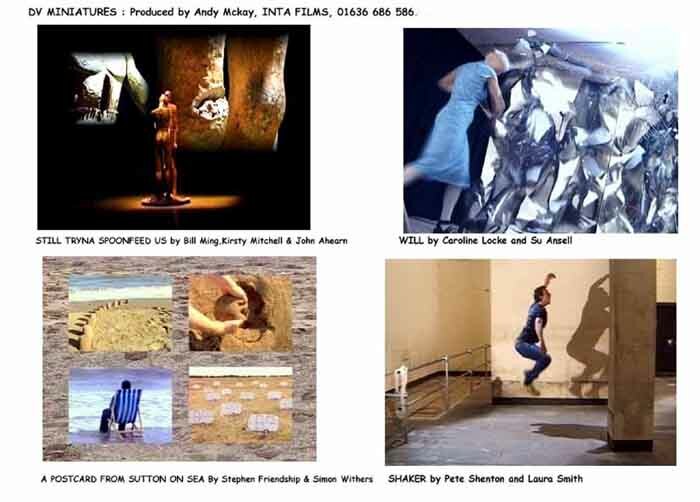 Conceived & directed by Stewart Collinson, Melanie Jordan and Andy Hewitt. 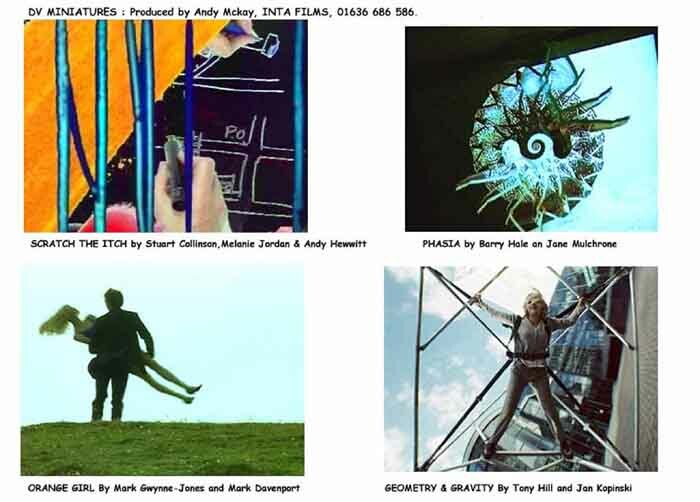 The film aims to make an exploration of geometry and gravity through the complex movement of a particular shape. The film also seeks to experiment with viewpoint, orientation and camera movement together with sound shape-shifting to disturb and undermine the 'normal' perceptions of reality. To create a structure which evolves from abstract images of moving light and shade, surfaces and edges to images of a person moving with an extraordinary motion through landscape and cityscape. A continuity of motion form and sound dynamic is maintained throughout. 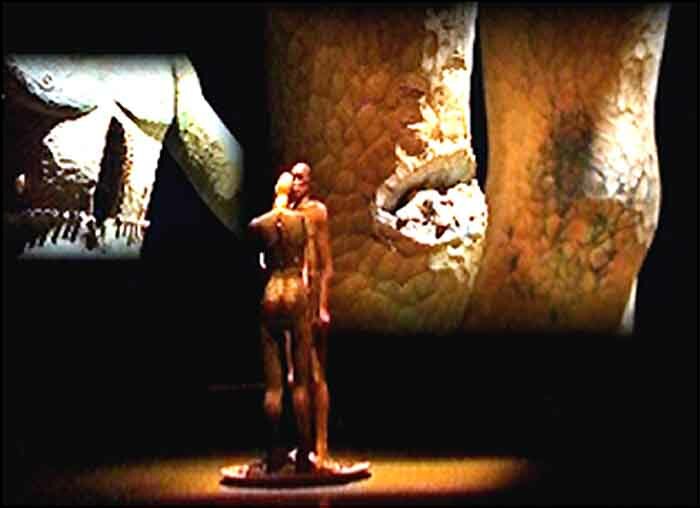 Inspired by one of Bill?s life-size wood carvings of human figures the film takes its subject from the idea of masks, the concealment of what lies behind them and the revealing of layers within human identity. Its imagery revolves around three principle elements as the piece evolves: The felling of a tree and the symbolism of its layers. Constantly moving shots of three sculptures and the iconography of their body fragments. And finally a digital montage of unfurling layers of images being stripped away to reveal layers beneath. The soundtrack is be based upon a sound poem derived from Bill?s Journals set to sounds gathered from the artists studio, the tree location and audio images concerned with identity. Developed from a collaboration between dancer Pete Shenton and film maker Laura Smith, Shaker is a tongue-in-cheek mix of dance and comedy, in which a man tries to capture the heart of a female choreographer, who?s only wish is to disappear.